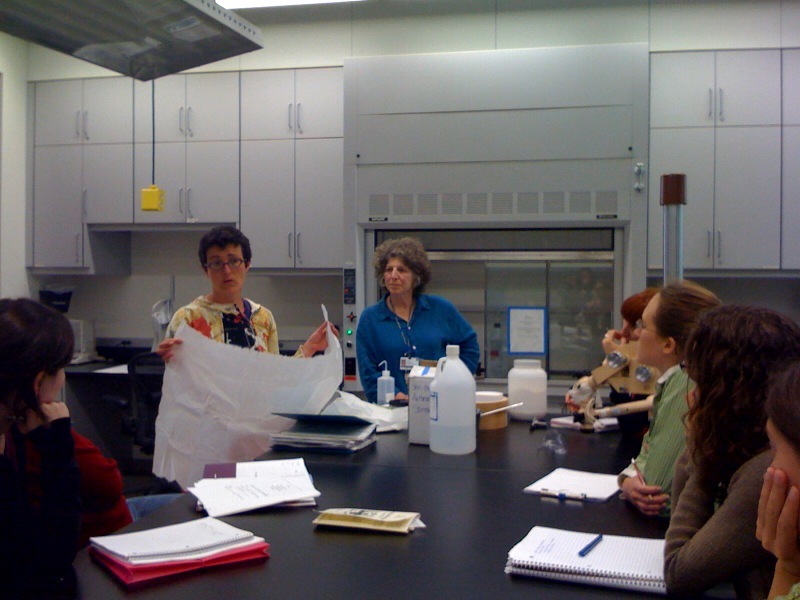 Two weeks ago paper conservator Christel Pesme lectured in the organic materials conservation course (CAEM 238) on some basics of paper conservation. 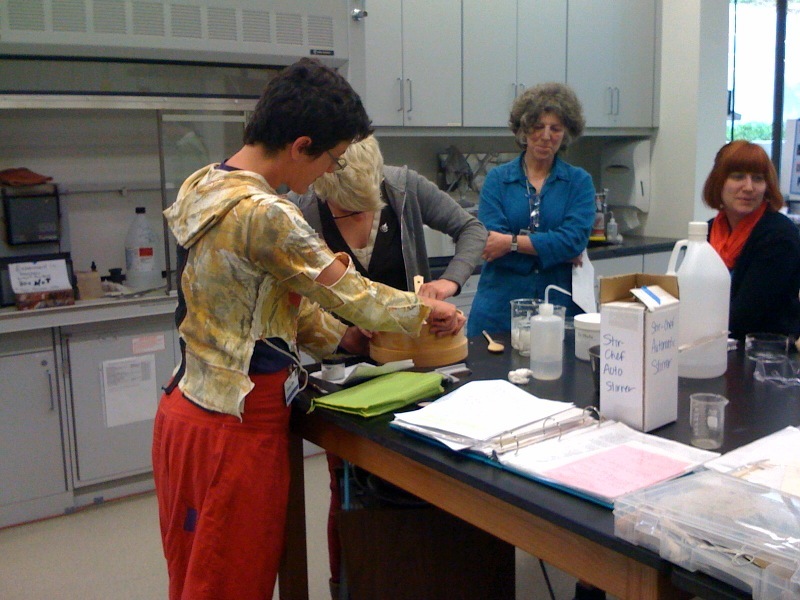 After going over the history of paper making and agents of deterioration, Christel talked to us about repairing tears and spent the afternoon showing us how to make wheat starch paste, one of the preferred adhesives for these types of mends. She went over what starch paste was and how the process used to make it affected the properties of the paste. 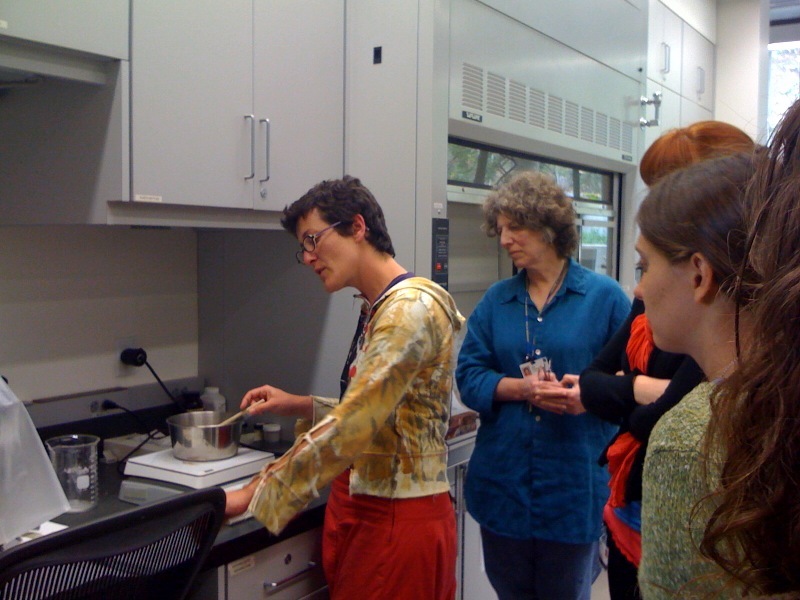 Then it was time to go up to the conservation lab to try out different recipes. There are several ways to make wheat starch paste (one we’ve used before can be found on the Northeast Document Conservation Center’s website), but the majority of the recipes seem to have the same things in commons: heating wheat starch paste and water, using really clean utensils of a specific material that are used only for making wheat starch paste (so as not to contaminate the paste) and that it generally takes a really long time to make the paste. Christel had previously worked at the Balboa Art Conservation Center in San Diego so we used their recipe for making wheat starch paste on a stove top (or in our case a hot plate). After mixing together the water and the dry wheat starch and letting it soak for a bit, it was time to turn on the heat and start mixing. Then there was more mixing, and more mixing, and about 45 minutes later, the paste had turned translucent, seemed a little more stringy and tacky and was done. 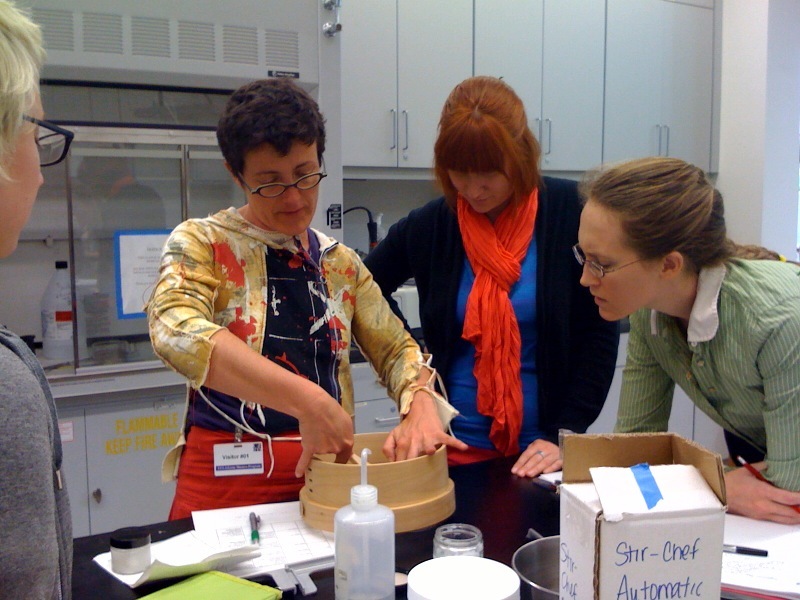 Good thing there were so many of us in the lab that day to take turns mixing or we would have had some very sore arms! Christel demonstrates how to make starch paste using the stove top method. Christel then demonstrated another method for making wheat starch paste using the microwave. This method lets you make the paste in a much shorter time and in smaller quantities. We put a little more water in this mixture and took our beaker down to the pantry to cook the paste. The beaker was put in the microwave with the stirred paste mixture and cooked initially for a minute and then in 30 second increments. Of course, making wheat starch paste can never be completely easy, even in the microwave. We had to keep a close eye on the contents of the beaker while it was heated. As soon as we saw the mixture start to rise and just reach the edge of the beaker, we had to have quick reflexes in order to stop the microwave and wait till the paste level dropped so we could continue heating it. It was then mixed by hand between heating cycles. The heating was completed when the paste had a similar appearance and texture to the one made up in the lab on the hot plate. 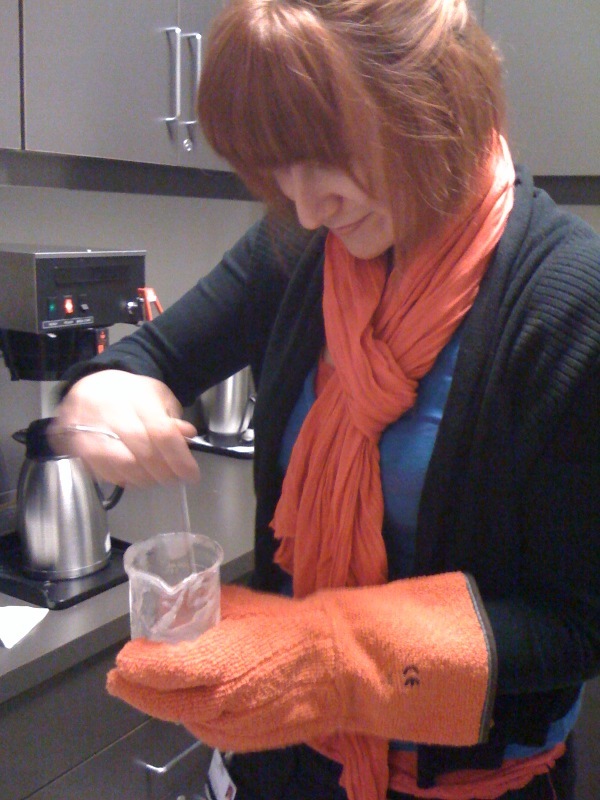 Cindy Lee Scott mixes the wheat starch paste during heating cycles. After the paste was cooked, a few more steps had to be taken before it could be used for the repairs. First the wheat starch paste was submerged in deionized water. This would help cool it and stop any skin from forming on the paste and and drying out, as well as prevent any changes to the composition of the paste. 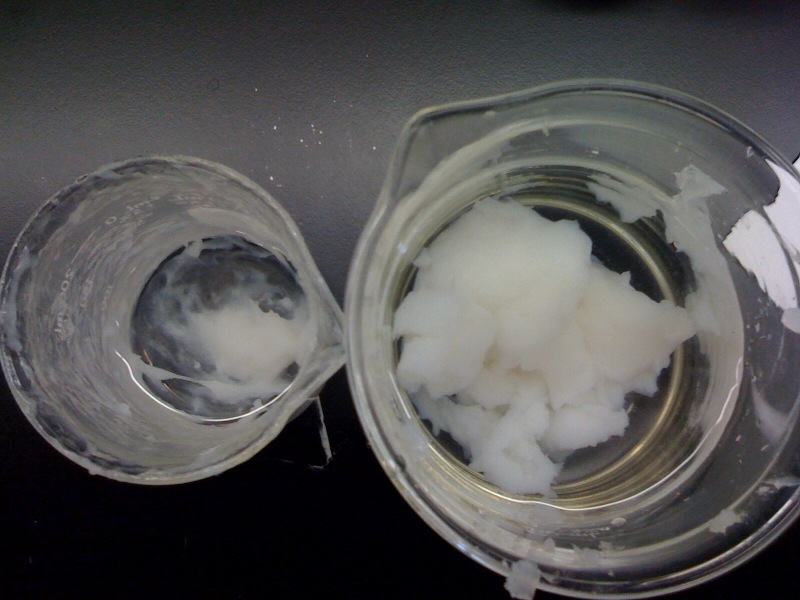 The wheat starch paste we made using the two methods. 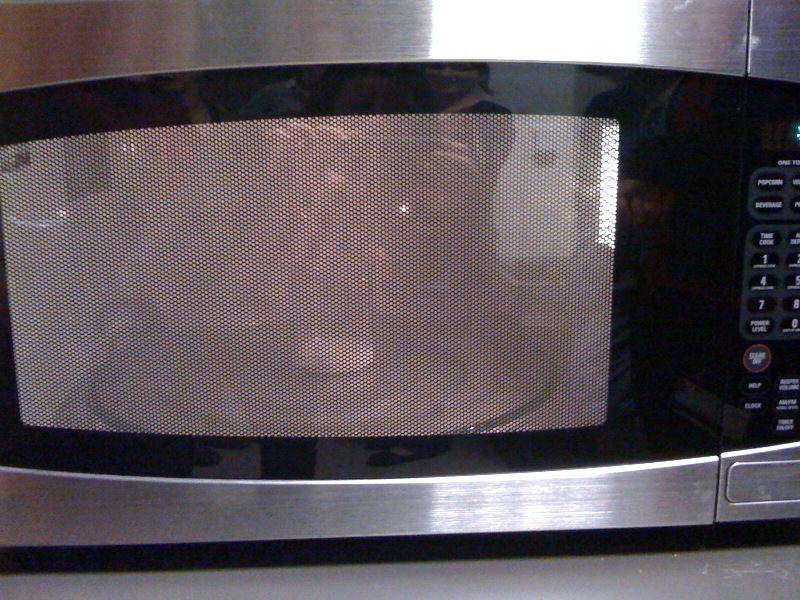 Microwave method is on the left, stove top on the right. After it had cooled, we separated out a small amount of paste we wanted to use for the mends and then strained it. Elizabeth Drolet tries her hand at straining the paste. We then took the strained paste and worked it by brushing it against the bottom of a glass dish. Deionized water was added until we got the consistency we needed for the mends. Christel suggested we continue working the paste and brushing it back and forth on the bottom of the glass dish until we got a “sour cream consistency”. 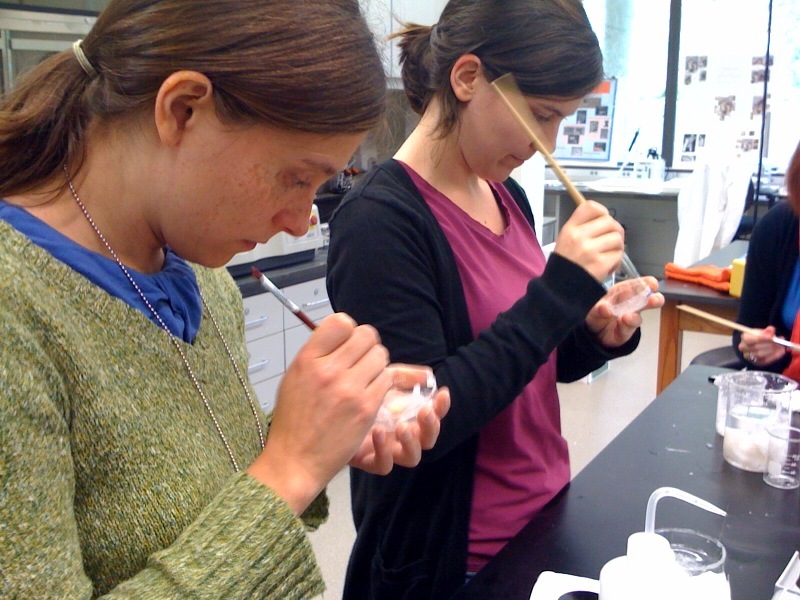 Tessa de Alarcon (left) and Nicole Ledoux (right) work some strained paste. Once the paste was worked and diluted, it was time to learn to make tear repairs. The tears in our “artwork” were mended using Kozo Japanese tissue. Lily Doan water tears strips of Japanese tissue to for the mends. We applied some starch paste to the edges of the tear and then gently brought the edges of the tear together. A strip of the tissue, onto which we had brushed starch paste, was placed on the back of the tear. We then put blotter paper and glass weights on top of the mend to apply pressure and absorb any moisture keeping the paper flat and preventing any buckling from occurring. 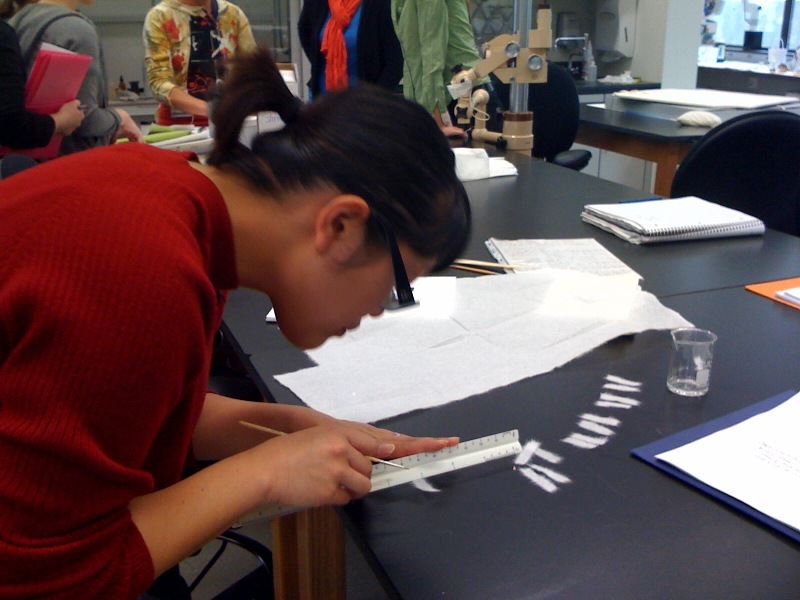 Lily Doan applies a strip of tissue coated with wheat starch paste to the back of a tear on a piece of paper. 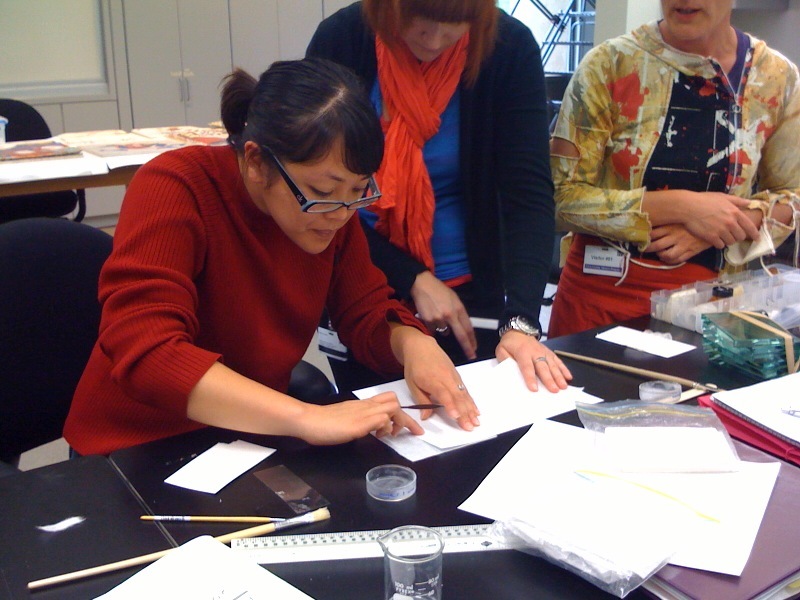 Working with a paper conservator to make the wheat starch paste and mend torn paper was interesting and fun. It was great to discuss differences in the application of starch paste to paper and objects. We also discussed how the moisture content of the paste and how the mends need to be held while drying posed challenges to the repair of organic three dimensional objects. But the most important lesson learned is that unless you want to work on your biceps, the next time we need to make wheat starch paste, we should make sure the microwave is available or we should invest in a sauce stirrer! Categories: Courses | Tags: Christel Pesme, mending, microwave, stove top, tear repair, wheat starch paste | Permalink.